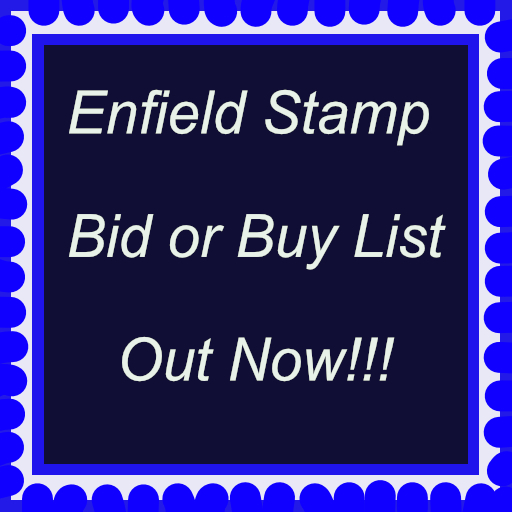 Enfield Stamp Bid or Buy List 440 - Enfield Stamp Company Ltd. I met up with Eric’s niece, Jackie last week. She had found another boot full of albums and books at his flat. Later in the week I received a package, in the post, from Jackie, of stamps and covers she found in Eris’s jumper draw. More “treasure” for us to work on. In this Newsletter, apart from a large haul of charity lots, we are featuring superb ranges from Eric’s collection. They include French Colonies; Germany – British & American Zones, French, Russian and some Post War locals; GB. 1841 1d’s in large numbers for plating; Iceland; Russia; Saar and Syria. A rare chance to acquire really nicely presented collections of scarcer stamps, from difficult countries, intact. Brenda and I are looking to have a couple of weeks holiday sometime in September. Dates are unconfirmed, at present, but we are probably going to close the shop during our vacation. David’s back and describing, so more exciting lots to come soon! 1945 set to 12a. (No 3 1/2a.& 6a. )C.£40 Approx.,etc.,fair to fine. which are mint from our usual charity and they are listed below. 104 Nature Of Australia pres.pack with 5c.,10c.,$2 & $5 Defins.,fine. to 6d.,9d. (2 shades)1s. (two shades),good to fine. (12) Must Cat. 117 All periods,predom U.,ranges on leaves & St.page,fair to good. 118 1953 M.range on leaves inc.1954 set to 10s.,etc.,good to fine. 124 1911-13 1d. Ovpt’d Levant,UM. (21)& M.vert.block of 24,(4×6),fine. 126 1937-1950’s M.& U.with some dup.on St.page,with vals.to 1r.,good. 127 1937-90’s M.& U.coll.Comm.& Defin.on album pages inc:1937 Ovpt. 130 Q.V.to c.1970-80 M.& U.accum.on Hagner leaves,with many Comm. U.,set out in random order,rainy afternoon project,fair to good. 139 G.V War Ovpts(6 diff. ),G.VI var.vals.to 1s.,1950 to 5s.,M.& U. 147 1937-1994 M.& U.coll.Comm.& Defin.on album pages inc:1938 3s.U. inc:1938-51 18Pi. (2),1964,1965 Europa sets,etc.etc.,good to fine. 150 Q.V.-Q.E.II M.& U.coll./accum.on leaves & St.page inc:Q.V.6p. 169 Mainly pre 1940 M.& U.range of lower vals.on St.page for sorting. 174 1916-39 Comprehensive M.& U.coll.on leaves inc:1916-17 to 5Fr. 185 1928 FLOOD Relief Air set,M.,on page,fine. (10) Not Cat.by SG. 186 1914-17 Red Cross issues,mainly M.(1 U. )range on pages comp.SG. 203 1896-97 P.Dues(M.3,U.2),1908-17 to 5Fr. (4),1922 New Cols.to 1Fr. 213 1925-30 M.& U.coll.on leaves inc:1925 Ovpts.to 25p.,1925(Mar.)2p. 225 P.Dues:1918 set to 50c. (with add.10c.M. )& 1918 Recouvrements 1c. Officials,few Comms.,Charities,etc.,some dup.noted,much to sort. 239 Mainly pre 1970 U.range on St.page,inc:1951 Humanitarian 30Pf. 242 1972-77 UM.& CTO.U. (one of each set UM.& U. )Comms.& Defins.coll. 245 Spremberg:1946 sets to 54Pf.Imperf.& Perf.,with 8Pf.& 12Pf.1Mk. bearing 2 1/2d.mauve,Pl.5,(damaged)& Pmk’d London S.W.,add. 264 2d.Stars:Nine U.examples,they all look large Crown,Perf.14,good. 273 Thirty-nine diff.Machin folded booklets & window types,var.vals. 277 1969 Defin.set to £1 with Perf.13 10s.,& £1,also 1d.& 1/6d. 294 1939-47 Karlsefni sets U.both Perf.14 & Perf.11 1/2 on page,SG. 297 1911 Sigurdsson set U.on page,also extra 4a.& 15a.,good to fine. 303 1938-45 U.coll.on pages inc:1938-47 Geyser set complete inc:Perf. 313 1938-45 M.coll.on pages inc:1938 Independence set,1939-45 Defin. 316 1920-30 Officials M.& U.coll.on page inc:set M.(SG.C.£180),U. 326 1907-08 Two Kings M.coll.of Defin.& Officials btwn.SG.81 & SG. 329 1922-35 M.& U.coll.on pages inc:1925 Views set M.(toned gum)& U. 337 Persia:1911-39 small,predom U.,range on leaves inc:1911 var.vals. 345 Earlies to c.1970 predom U.range on St.page inc:1951 MILAN 55L. 346 1870-1958 M.& U.coll.,neatly mounted on leaves,inc:1912-20 to 6d. set),1898-1900 4c.on 3c.,4c.on 5c.,1949 UPU.sets(2),S.UJONG 3c. 370 All periods,predom U.,few M.,range on St.page,inc:1858-62 4d.(SG. 373 1903 1/2d.,2d.to 3d.,1904-08 1/2d.to 2d.,1908-14 1/2d.2d.,2 1/2d. 380 1870’s-1960’s M.& U.coll.with dup.on Hagner & pages inc:many QV. 382 All periods M.& U.random ranges on St.page & leaves,for sorting. 399 1949-53 1a(2),1 1/2a(2),2a(2),3a,6a,8a,10a,12a,M.,on page,fine. another set(with add.15c. )on Airmail(Air France)E.to Kent,good. 408 BSAC to c.1970 predom U.all periods range on leaves,inc:R.& N.
417 1937 Death Of Pushkin M.& U.range on leaves,with many diff.Perfs. 433 Q.V.-G.V M.& U. (12)range on page inc:Q.V.Heads(14),Edw.var.vals. 1895 2c.(M. )4c.to 8c.(U. ),later vals.to 50c.,etc.,fair to fine. 438 1953-72 M.& U.coll.on St.pages with some Comm.sets,also Defin. 448 1912-35 mostly M.coll.on album pages inc:1921 Defin.set to 12a. 451 1937-51 M.(1937 Coro.set U. )coll.on album pages inc:1942 set M.
457 1977-90’s U.coll.on album pages,all homelands,vals.to R2,good. 459 1900-49 M.& U.coll.on album pages inc:1927-30 1s.vert.pair U.(SG. 464 1897-1954 somewhat dup.,M.& U.range on Hagner leaves inc:Ovpts. 469 1960 Defin.set to 2Fr. (No Granite issues)with 5c.,10c.,20c.,50c. 472 UM.range of Comms.btwn.SG.651 & SG.866,some in blocks,all fine. 473 1949 UPU.set in UM.blocks of four,some age tone spotting,good. 495 1909-60 M.& U.coll.on leaves inc:1913-23 to 1s.,War Tax Ovpts. 497 1954 set to 5s.with 1953 Coro.,UM.or M.,on leaves,good to fine. ,3s.,1928 1/2d.to 2s.,5s.,M.,range on Hagner page,good to fine. 507 M.& U.,mainly modern,coll.on leaves & loose,inc:1898-1902 8a.(M. 512 1962-65 UM.or M.Comms.coll.on beautifully written up leaves inc.